Kick off your visit on the 17th (Wed): admire the masterpieces at Flinders University Art Museum & City Gallery, then identify plant and animal life at Cleland Wildlife Park, and then stop by Unique Opal Mine Pty Ltd. 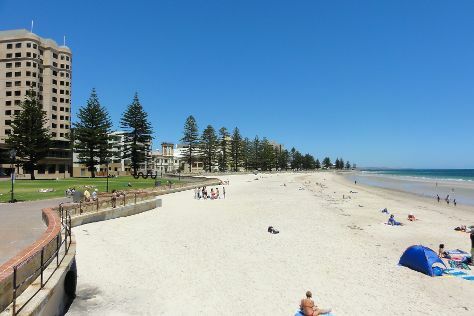 Here are some ideas for day two: enjoy the sand and surf at Glenelg Beach and then kick back and relax at Aldinga Beach. To find more things to do, maps, where to stay, and tourist information, read Adelaide online vacation builder . Sydney to Adelaide is an approximately 4.5-hour flight. You can also drive; or take a bus. Expect little chillier evenings in Adelaide when traveling from Sydney in April, with lows around 14°C. Finish your sightseeing early on the 18th (Thu) so you can travel to Naracoorte. Naracoorte is a town in the Limestone Coast region of South Australia, approximately 336 kilometres south-east of Adelaide and 100 kilometres north of Mount Gambier on the Riddoch Highway .HistoryNaracoorte was formed from the merger of two towns, Kincraig, founded in 1845 by Scottish explorer William Macintosh, and Narracoorte, established as a government settlement in 1847. Start off your visit on the 19th (Fri): hike along Black Cockatoo Bush Camp Hiking Trails, then explore the fascinating underground world of Naracoorte Caves National Park, and then look for gifts at Yulgilbar Wood Gallery. To see where to stay, more things to do, traveler tips, and other tourist information, use the Naracoorte online trip itinerary maker . You can drive from Adelaide to Naracoorte in 4 hours. Finish your sightseeing early on the 19th (Fri) so you can travel to Warrnambool. Warrnambool is a regional centre and former port city on the south-western coast of Victoria, Australia. Kick off your visit on the 20th (Sat): identify plant and animal life at Childer's Cove, enjoy the sand and surf at Logan's Beach, then explore the landscape on two wheels at Foreshore Promenade, and finally look for all kinds of wild species at Thunder point Coastal Reserve. To find traveler tips, more things to do, photos, and more tourist information, you can read our Warrnambool itinerary planner. Traveling by car from Naracoorte to Warrnambool takes 3.5 hours. Finish your sightseeing early on the 20th (Sat) so you can drive to Apollo Bay. Apollo Bay is a coastal town in southwestern Victoria, Australia. 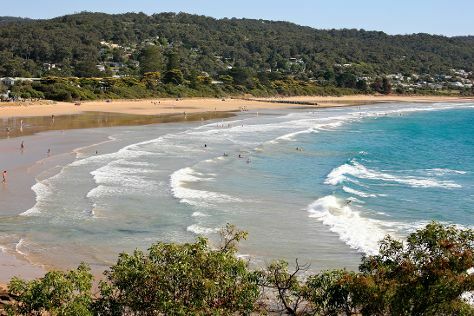 On the 21st (Sun), take a peaceful walk through Lorne Beach. On your second day here, hike along Great Ocean Walk, stop by Bay of Apostles, and then tour the pleasant surroundings at Johanna Beach. To find photos, traveler tips, ratings, and tourist information, go to the Apollo Bay visit planner. You can drive from Warrnambool to Apollo Bay in 3 hours. Alternatively, you can take a bus; or do a combination of train and bus. Finish up your sightseeing early on the 22nd (Mon) so you can go by car to Melbourne. Start off your visit on the 23rd (Tue): kick back and relax at St. Kilda Beach, learn about all things military at Shrine of Remembrance, then don't miss a visit to Royal Botanic Gardens, and finally enjoy breathtaking views from Eureka Skydeck 88. Keep things going the next day: get to know the resident critters at Melbourne Zoo, then indulge in some culinary diversions at a local gastronomic tour, and then admire the landmark architecture of Ross House. To see photos, maps, other places to visit, and other tourist information, refer to the Melbourne online trip itinerary builder . Traveling by car from Apollo Bay to Melbourne takes 3 hours. Alternatively, you can do a combination of bus and train; or take a bus. 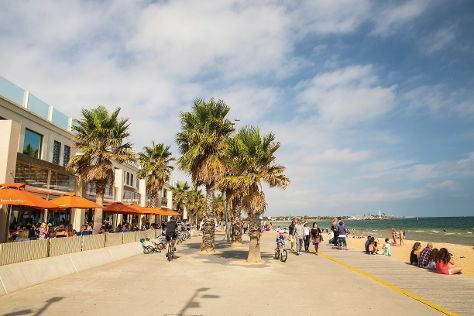 In April, plan for daily highs up to 23°C, and evening lows to 11°C. Wrap up your sightseeing on the 24th (Wed) early enough to travel back home.